On World Environment Day (June 5) this year, we can’t think of a better way to celebrate than by encouraging kids to get grubby with our favourite mini environmentalist — Dirt Girl. One of the best ways to help your child connect with their natural environment is to spend time outside, do some growing in the garden and, even better, get them to keep a scrapbook of their adventures. The new dirtgirlworld scrapbook can become a daily diary, a garden journal, a recipe book, an art pad or a field guide — in fact, anything kids would like. There’s also an expansion pack, with planting guides, weather stickers and more great ideas for keeping the journal. I love that this is an item that your child can use and expand over time to express themselves and record their own experiences in their natural environment — and hopefully to foster an appreciation for the great outdoors as well. I also love that it’s printed in Australia on 100% recycled paper. To celebrate the release of the dirtgirlworld scrapbook and World Environment Day, there are some wonderful eco carnivales happening throughout Australia. 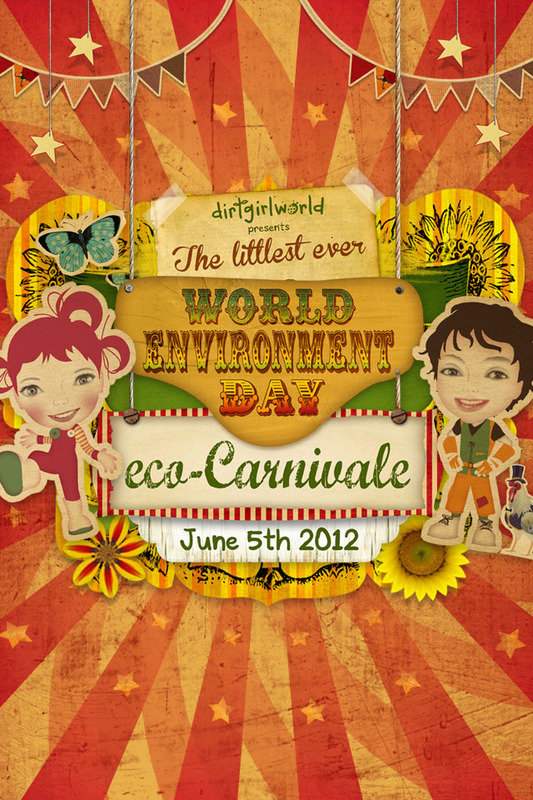 Visit www.dirtgirlworld.com/worldenvironmentday for more information and for a chance to win some amazing prizes too, including a Plan Toys Eco Charging Station from Itty Bitty Greenie! The dirtgirlworld scrapbook and expansion pack are available at Itty Bitty Greenie. While I like to think that every day is Earth Day in our house, I know that when the internationally recognized Earth Day pops up on the calendar, it’s a chance to get others thinking about things they can do to show their consideration for this great big planet of ours. Earth Day started in San Francisco in 1970 to inspire awareness and appreciation for the Earth’s natural environment. Why San Francisco? Well it’s the city named after Saint Francis, the patron saint of ecology. That, and there was a senator there who decided to hold a “teach-in” on April 22, 1970 to educate and mobilize people on environmental issues. To everyone’s surprise, 20 million Americans participated in colleges and universities, while environmental groups also came together recognizing they shared common values. Now lead by the Earth Day Network, 1 billion people participate in Earth Day activities on April 22 each year, making it the largest civic observance in the world. The network works year round to broaden the environmental movement through education, programs and partnerships that affect change at the local, national and international level. And for little ol’ you and me, Earth Day is a chance to reflect – ideally with the whole family – on ways to help preserve and protect our environment, and more importantly, act. Whether you have a discussion at the dinner table, get the kids involved in some garden activities or crafts, or simply pledge your act of green along with millions of others on the Earth Day website, no gesture is too small. Tell us your act of green right here and you have a chance to win a $100 gift voucher from Itty Bitty Greenie. Add your comment below – and one lucky greenie will be chosen and notified on April 23. For more information, visit the Earth Day Network, which has a variety of tools to help you plan your own Earth Day event, or simply pledge your act of green, right along with millions of others across the globe. Also, visit our “Earth Day” board on Pinterest, for more tips and activities to get your green on this year. Ever since the Greenhouse restaurant in Sydney was featured in an episode of Australian MasterChef last year, I have been waiting with anticipation for Joost Bakker, the brainchild of the pop-up sustainable restaurant concept, to bring a similar event to Melbourne. This year during the food and wine festival, I had my chance. Last night some girlfriends and I popped in to this city’s first pop-up restaurant, which is built using only recycled or sustainable materials. The floor is made from old conveyor belting, the chairs from disused irrigation pipes, recycled bottles and jars are the drinking glasses of choice, and terracotta-potted strawberry plants line the façade of the structure, which is mostly timber and old shipping containers stacked four-high. Bakker is a Dutch-born florist, artist, builder and environmentalist who has inspired people across Australia with his visionary concept of “no waste” dining, and everyone at our table last night had to admit it was impressive. The dinner was a four-course French-inspired feast created by Auckland chef Simon Wright (The French Café) and Melbourne’s Nicolas Poelart (Embrasse), which celebrated fresh, local and seasonal food in some most unexpected ways. The standout dishes were Wright’s first course of marinated kingfish, spanner crab, apple jelly, verjus, shaved fennel and crème fraiche – which awakened the palette and made us all hungry for more. This was followed by a dish of Australian marron, then another of roast pheasant and finally, the piece de resistance, was Poelart’s dessert called “forest floor”. Served on a piece of plywood covered in chocolate “dirt” were chocolate and meringue “mushrooms” along with fresh mint and sorrel granita. It looks like something straight out of a fairytale and it disappeared in record time. In addition to the wonderful food was a jovial atmosphere and quirkiness that made the entire experience unique. I had the pleasure of sitting next to Rod Barbey, Australia’s only certified organic chef, from Organic Matters Food & Wine Store in Hawthorn East, who like me, wanted to experience the Greenhouse above all else at the festival. Even a trip to the loo was educational, as diners were told in a note on the bathroom wall that their “wee” was going to be used to help grow mustard plants. From the light fixtures made from vintage tins to the herb gardens planted outside in old metal barrels, the resourcefulness and attention to detail was unlike anything I’ve ever seen. There is only a week left to experience the Greenhouse in Melbourne, as Bakker’s masterpiece will be taken down from the banks of the Yarra after the festival, which closes on March 21. I hope I can get back there just to have a drink at the rooftop bar! No one would argue against hand washing as one of the most effective ways to prevent the spread of germs, but with the proliferation of antibacterial soaps, hand sanitizers and other products, we are cleaner than ever before – and that might not be a good thing. Research has shown that use of antibacterial soaps can do more harm than good, by killing off beneficial bacteria as well as harmful bacteria on our skin, while also creating a resistance to superbugs and antibiotics. Some antibacterial-soaps contain a chemical called triclosan, an antibacterial agent potentially harmful to humans and the environment. The chemical can be found in many consumer products, from cosmetics such as soap and deodorant to dish soap, facial tissues, bed linens and toys. In terms of its environmental impact, triclosan can poison aquatic life, persist in the surrounding environment, and bioaccumulate in animals. It has also been found in human blood, urine and breast milk. Triclosan is currently under review by the American Food and Drug Association and Health Canada, but there is no regulation against the chemical in products sold in Australia. Doctors and scientists world wide agree that the best course of action is to stop using antibacterial products (soap & water is best) and read labels on all products before buying, to avoid harmful chemicals such as triclosan. With this in mind, I went in search of an alternative hand wash that would be safe and eco friendly for my family, and found Ollie’s Happy Hands Sudz by Taslie Skin Care. Made in Canada, this brand is chemical free, and contains certified organic ingredients that are PH balanced and suitable for sensitive skin. The packaging is printed with soy inks and is recyclable. Best of all, my little guy loves the colourful octopus pump so much, he never forgets to wash his hands after going to the toilet! For more information, read the Centre for a Liveable Future’s article on the health and environmental risks of antibacterial products. Also, here’s a handy Dirty Dozen list of cosmetic chemicals to avoid. California, where it’s easy to be green. We spent the last couple of weeks in sunny California, which was a welcome break after more than a year of working on Itty Bitty Greenie – and also a chance to meet up with my family, who flew in from Canada to join us on our holiday. I always seem to have my green radar on, so I tend to notice things like green-rated hotels, an abundance of hybrid vehicles and the recycling trucks that run on natural gas. As we settled in to our lovely beach house with the organic fruit and yogurt bar down the street, and the massive Whole Foods market and amazing farmers markets where we did our shopping, I realized I was in eco heaven! – there is an abundance of amazing eco products for children and I couldn’t resist taking home things from California Baby, Tomat for Kids, and more. – almost everywhere, there are random things with eco value – like at Legoland, many of their park benches were made from recycled milk jugs – cool! – the state is known for its wineries, and in recent years there has been a push on sustainable wine growing. Many top-class wineries are using eco practises for production – which made my wine shopping a joy! Overall, I fell in love with the fact that living sustainably and making green choices seemed to be second nature and extremely mainstream, while at home in Australia it often still feels like an alternative lifestyle choice. Awareness is growing here, but it was inspiring to see how easy it can be, to be green. Click here to discover our new range of organic and eco-friendly clothing from California label Tomat for kids. We’re a finalist for Best Eco-Friendly Business! Mums in business are a fascinating bunch – and there are days when I wonder what I’ve gotten myself into, trying to juggle the demands of my Itty Bitty business (which is a one-person operation) as well as the demands of motherhood and a part-time job on top of it all. But thankfully there’s an online community called Connect2Mums that provides support and encouragement for parents – especially those who’ve made the leap into the business world. It’s a place to network, share ideas, learn and support each other, and on some days it’s a godsend when I’m fighting the battle alone with only my laptop for company. A few days ago I was thrilled to learn that Itty Bitty Greenie has been named a finalist for the annual AusMumpreneur Awards in the “Eco-Friendly Business” category. The idea that there are other parents who’ve recognized my efforts and also to have a chance to celebrate them among a roomful of other inspiring people is just… awesome! The awards recognize mums in business across Australia and New Zealand, and are presented at a gala ceremony held in Sydney on August 27. In addition to the main awards categories, there are a number of people’s choice awards – and that’s where YOU come in. Itty Bitty Greenie has been named a finalist in the “Best Boutique / Store” category, and you have a chance to vote for me and also discover some other wonderful mums in business who are doing great things. 2. Follow the link on the home page to the people’s choice awards “Best Boutique / Store” Album, which looks like the image at right. 3. Click on Itty Bitty Greenie’s profile (it’s at the bottom right, on the second page) and click on the ‘LIKE’ button at the base of the description. OR you can click here, you will just need to register and log in to the site. Thank you in advance for your vote, and even more, for the vote of confidence and support you’ve offered throughout this past year. I grew up in Canada, so when I think about forests, I picture majestic, sky scraping old-growth trees in the Rocky Mountains and journeys along the Trans-Canada Highway passing logging trucks stacked with the biggest toothpicks in the world. As World Environment Day approaches (June 5), the United Nations General Assembly wants everyone to think of forests and how they play a key role in the battle against climate change. To raise awareness on sustainable management, conservation and sustainable development of all types of forests, the UN has declared 2011 as the International Year of Forests, and World Environment Day (which started in 1972) is one of the main vehicles through which the UN stimulates worldwide awareness of the environment and encourages political attention and action. On a more local level, I have decided to mark the day this year by getting involved in a community tree-planting initiative with Greenfleet and Parks Victoria. Next Sunday, they are hosting a free, family friendly event in Berwick, Victoria, with tree planting, nature walks and children’s activities. Itty Bitty Greenie has donated 100% recycled paper colouring pages and 100% recycled eco-star crayons for the kids, as a fun way to educate about the importance of conserving and recycling paper in order to save trees. And for those who don’t know about Greenfleet, they are an Australian not-for-profit environmental organization that encourages businesses and individuals to avoid and reduce greenhouse gas emissions and then offset any remaining emissions by planting native forests. When Easter rolls around, I’ll be the first to admit that all thoughts turn to chocolate. And I’m not the only one, as chocolate is a $100-million industry in Australia and a $100-billion industry world wide. But also like many people, until recently I gave little thought to how cacao was harvested – where and how – and I had no knowledge that much of it involves child or trafficked labour. A new report released by World Vision Australia reveals that most of the world’s cocoa comes from West Africa, where children as young as eight years old are taken from their families to work in the cocoa fields of Ghana and the Ivory Coast. The issue for consumers though, is that even through most of us would be willing to pay a little more for it, fair trade chocolate is often not easy to find. A quick trip to the local supermarket this week to stock up on Easter supplies was disappointing for the lack of fair trade options – and rather than buy the cheap chocolate that was there in abundance, I went home empty handed. “Our report shows only 1 to 3 percent of global cocoa supply is ethically certified today. Despite the best projections for growth in ethical cocoa, it’s expected 60-75 percent globally will still be uncertified in 2018,” Costello said. So, like many things – unless consumers choose to “vote” with their dollar to support ethical brands, we will continue to contribute to the problem. I guess this gives new meaning to the Easter egg hunt … how far do we have to hunt for fair trade brands?